LG Display posted a very interesting article explaining their flexible OLEDs, and giving some predictions (based on IHS DisplayBank estimates) about the flexible OLED market. A couple of months ago LG already stated that they see a very bright future for flexible OLEDs and they intend to take the lead in this emerging display market. So first of all, LGD explains the structure of their flexible OLED panel (see below). It is based on a plastic (polyimide) substrate as we already know, and LG gives some more information about their Face Seal method which was discussed before but with very little details. So it turns out that Face Seal (developed by LG themselves) is a multi-layered organic and in-organic film. LG's scheme (shown above) also explains why those plastic OLEDs are thinner than glass-based OLEDs, with the Face-Seal film encapsulating over the organic materials directly. LGD also shows us the manufacturing process (see above). They first coat the polyimide on a a glass sheet. The TFTs are formed on the polyimide, and then the organic layers and the encapsulation layers are deposited. Finally, the glass is removed (delaminated) which makes the panel flexible. LG also adds a "back plate" to the flexible panel to make it stronger, it's not clear what that back plate is exactly. LG quotes IHS DisplayBank's reports, saying that flexible OLEDs are expected to become a $41 billion market by 2020. Over 50% of those displays will be used in "new applications" and 33% will be used in smartphones. From 2015, the market will more or less double each year. Flexible displays will amount to 16% of the total FPD market in 2020. It's great to see LG so optimistic about flexible OLEDs (but this isn't news, of course). Still those new reports from IHS seems more down to earth compared to earlier reports quoted by LG saying that flexible displays will grab 40% of the smartphone display market by 2018. 1) So far LG has been using an RGBW approach in their OLED architecture. In the schematics they only show RGB. Is that for reasons of simplicity or are they going to drop the RGBW approach? 2) I'm a little surprised that the market roadmap doesn't include lighting. Is that because the table focuses on displays only or do they really expect no market for flexible OLED lighting? 1. LG is using WRGB for large-sized panels (OLED TVs), but adopts RGB (direct-emission) for small panels. This was stated by LG a few years ago and there's no reason to believe they will drop WRGB for OLED TVs. 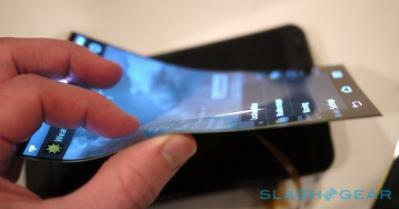 Predictions for flexible oleds in tablet pc is very low! The predictions for flexible oleds in tablet pc, is very low? When flexible oleds will have an avalanche in growth in smartphones and grow as Monitor display tech, shouldn't it also then have a much higher growth in tablet pc? Re: Predictions for flexible oleds in tablet pc is very low! I think when someone from a major cell phone/tablet producer comes out & states OLEDS are not yet stable enough (i.e. referring to the degradation of colors over time) that there is urgency for anything over 6 inches in the market. Fortunately there are company's out doing the R&D to get encapsulation in a vacuum so there is less chance of organic material break down (decomposition). Can someone comment on the role of the polarizer film for the flexible OLED. I'm no expert in this subject, but my understanding is that the polarizing film serves to prevent any internally-reflected light from exiting the display, which helps improve contrast (so you don't get lighting of black areas caused by bright neighboring pixels). Flexible OLEDs, finally ready to take over the display market?